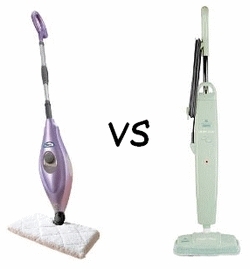 Are you confused about whether you should get the Bissell steam mop vs Shark steam mop? Don’t worry about it because lots of other people are confused as well! These are two of the highest rated steam mops on the market and we will be looking at each of them side by side. We will be comparing the Bissell steam mop vs Shark steam mop so you can figure out which one is better suited to your home, needs and budget. First off, we will be comparing the Shark steamer model S3501N Deluxe and S3101 against the Bissell’s 1867-7 Hard floor cleaner. This will help prevent any confusion as there are many different mop models for each brand. The Shark steam cleaner is well known for being extremely light weight and easy to move around. This is a great design feature for folks who don’t particularly enjoy lifting heavy objects from place to place. In some cases, people have found that the Shark’s light weight mop structure makes it fragile and prone to breakage. Another awesome feature of the Shark is that it will be ready to go in 30 seconds flat. If you’re always on the move and need to do your cleaning in short bursts, then this Shark certainly delivers. It doesn’t matter if you’re a high powered CEO or late for that little league match, the Shark will help you get those floors clean in no time at all. The interesting thing about the Shark is how adaptable it is to its environment. The swivel head allows great ease of movement so that you don’t have to stress about corners and hard to reach places. By using the swivel head, you can clean around furniture, fixtures and anything else. The final spectacular feature that is particularly notable about the Shark steam mop is its extra long 30 feet cord. This allows you to clean large spaces with ease without having to unplug. Read our full review of the Shark Steam Pocket Mop here. The Bissell floor cleaner is a superb floor cleaner that will undoubtedly get your flooring super clean without added chemicals. This is a great option especially if you have young children or teenagers in your home that may be extra sensitive to chemicals. One of the notable things about the Bissell is that it is very sturdily built and will surely last you many years to come. It also sports a swivel mop head as well as reusable microfiber pads which you can simply wash and re-use again. This is a superb solution over disposable mop heads as it is a more green conscious choice and will help you to save money. Quite similarly to the Shark steam mop, it also takes a mere 30 seconds to heat up and get going. It can last about fifteen minutes of none stop cleaning that certainly won’t disappoint. Unlike the Shark, it also has a built in water filter so that the impurities from the water don’t damage your steamer. This is a great feature that will ensure your machine lasts even longer. Read our full review of the Bissell 1867-7 Hard Floor Cleaner here. The biggest similarity between these two machines is that they both were manufactured to clean all types of floors. These include but are not limited to tile, granite, stone, concrete etc. However, both of them should NOT be used to clean hardwood floors since the condensed steam can damage the wood by causing it to swell. The next thing we will compare is of course, the temperature of the steam. The Shark on one hand had steam at temperatures of around 110 degrees which is quite low. On the other hand, the Bissell has a little more at 125 degrees. Also, in Bissell’s instructions, they actually let you know that you should hold the steamer over a tough cleaning spot for at least 15 seconds. Next, the Bissell has proven itself to be sturdier and better built that the Shark. There are many instances where parts of the Shark broke easily and needed to be replaced. The Bissell has proven itself to have stronger parts that don’t break as easily. The next factor that we will briefly look is how long you can use each machine. The Shark clocks in at about ten minutes with a 10 oz. water tank and you have to unplug and refill the tank to continue. The Bissell has a bigger tank that can hold 13 oz of water and will last about 12 to 15 minutes of cleaning. Lastly, the Shark gains an upper hand on the Bissel when it comes to added functionality. The Shark also comes with a carpet glider attachment that allows you to also steam carpets. The Bissell does not come with this added attachment so you can only use it to clean floors. In conclusion, these are two great machines that have their differences, but the same common goal. They have both achieved high ratings on Amazon by thousands of actual customers which speaks for itself. Once you examine the above factors, you will be able to decide which steamer is the one for your specific needs. Both are excellent – so the best thing to do is look at your needs and then decide what is the best fit for you.